After having worked through and published over forty annotated games, in the process employing what I'd consider to be a simple and straightforward method of computer-assisted analysis, I've acquired an idea of some of the major pitfalls, as well as the benefits, of using chess engines. In sharing the following observations, it's worth noting that they are offered from the point of view of an improving Class player, rather than that of a professional chessplayer or computer programmer, whose needs and approaches to using computers may well be different. Ironically in my view, one of the most pernicious pitfalls for the improving player is psychological: the sense of failure that can result after seeing computer analysis repeatedly demonstrate wins missed or ways that a loss could have been avoided. How often do you see players comment about how stupid they feel or how bad their chess is following a game? It's important to have the mental toughness to stop kicking yourself afterwards and truly learn from your mistakes, rather than waste mental energy on self-denigration. 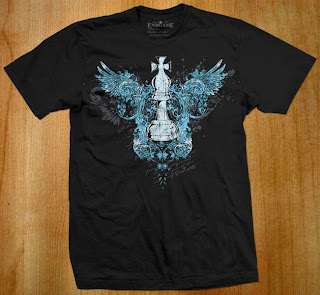 Let the chess engine serve its function as a constructive tool to be used for improvement purposes. While outright blunders and forced wins are easily highlighted by engine analysis, the "best move" in a position is often not so easy to determine. This may even be impossible, given broadly conflicting plans and ideas: see what super-GM Kramnik has to say about this. In practical terms, engine evaluations that differ by 0.1 pawns are essentially equivalent and I would not sweat too much over a difference of up to 0.2 pawns. Only looking at a single visible line of analysis (the engine's top choice) can therefore be misleading when trying to understand a position; unfortunately, that is usually the default setting for a lot of software programs. For analysis purposes, a player needs to have multiple move choices (lines) visible in order to better comprehend the potential of a position; having 3 lines visible is my preference. Trusting the initially displayed engine move evaluations can be counterproductive to analysis and misleading. Engines need time to sort through possibilities in non-forcing situations and at least 1-2 minutes should be allowed when looking at a move using "infinite analysis" before proceeding. Stepping through subsequent moves of key variations is also very important and may change the evaluation of the line, after the engine is able to calculate further ahead in it. Computers are of less practical help in objectively evaluating best opening play, due to the sheer number of possibilities and lack of forcing tactics leading to an advantage. The best use of an engine in the opening phase is instead to search for and evaluate alternative moves that don't appear in, or are neglected by, opening theory; this is how the professionals use them to find theoretical novelties. Playing a move suggested by an engine is dangerous when you don't understand why it should be played. This is one of the main reasons that blindly following engine recommendations in the opening can be counterproductive, even if they are objectively "best" from the engine's point of view. Ending up in a middlegame position that you don't know how to play is often a quick route to defeat. In situations without forcing tactics, different engines may have significantly different assessments of the position. It's therefore important to understand as best you can the particular biases and limitations of the engines you use, and/or use multiple ones for analysis. Common biases include over-valuing material and mis-evaluating endgames in the absence of tablebases. For example, having initially run through my past tournament games with Fritz and now using Houdini to assist in analyzing them, I've run across several instances of key positions where Fritz preferred a different move, while Houdini has supported my original evaluation and move choice. In the end, the point of seriously analyzing your games (or anyone else's) is to achieve a greater understanding of them and through that, of the game of chess in general. It's therefore wise to remember that the computer is there to support and asisst you, not to function as some sort of ultimate arbiter of what is correct and should always be played. This companion post to Tournament Preparation: Chess Skills discusses some techniques that players can use to mentally prepare themselves for success at a tournament. Most importantly in practical terms, mental toughness and improved focus will enable a player to better leverage their existing chess skills, which in turn will lead to a higher performance level. Furthermore, good mental preparation will help form a bulwark against negative thinking and results, while also helping one recover more quickly from a bad outcome. Below is a set of conscious decisions that can be made, or attitudes that can be adopted, regarding your chess game. Using these techniques has assisted me in combating negative and unproductive modes of thinking. In fact, I credit them as being a key part of my improved chess performance since this blog was started, which has included beating the strongest opponent (2100+) faced in my chess career. I believe that the techniques listed here will all contribute to a player becoming mentally tougher at the board, as they address (directly or indirectly) a number of the unhelpful fears, anxieties and fantasies we may have about our tournament performance. Treat each game as an individual chance to excel at an activity you enjoy, while accepting the fact that you may lose. If you lose, take away lessons from it both in terms of chess skill and mental preparation. Do not waste energy on excuses, whether or not they are justified. If you win, enjoy your victory but be sure to identify what your opponent did to allow it, since you did not win the game alone. In this way, each game will become another stepping stone on your path to mastery. Consider every opponent as worthy, but able to be defeated. Do not worry about your opponent's rating during the game, as this becomes a source of fear and loathing. Resolve to play what the position demands. If your opponent's position is vulnerable to an attack, then go on the offensive; do not play passively. If your opponent's attack will end up coming first, or your attack has failed and and a counterattack is imminent, find the mental coolness necessary to defend well. It requires mental courage for both attack and defense. Do not think about the probable future result of the game while it is in progress; think about what you (and your opponent) can do with the position on the board. There is a big difference between what should be a winning position and what is actually a won position; do not confuse the two. Do not think about your current or future tournament standing during the game. The position in front of you is not affected by your current score or by how many future points you may fantasize about winning. Consciously accept your overall limitations while playing in the tournament, so that you are not distracted by your perceived failings as a chessplayer; address them later as part of your long-term training program. During a tournament, you will not be able to remember by rote all of your opening lines; this is normal and will not make you ignorant and helpless. You are also unlikely to make major new breakthroughs in middlegame or endgame knowledge while the tournament is in progress; instead, recognize that what you know gives you enough skills to play well and win against comparable opposition. These practices can of course be difficult to adhere to, especially the ones where you resolve to not think or do something. The point here is to have a conscious goal of ignoring certain things which will only serve to distract you from the central activity of playing chess to the best of your ability. When these distractions do occur, with your additional mental toughness you can identify them and then mentally set them aside, thereby returning to a more productive thought process that is focused on the position in front of you. Again, perfection in thought is not the goal, just as perfection in play is not attainable. However, an end result of more productive behavior and thinking at the chessboard (or computer, for online tournaments) is quite attainable. There are also broader practices involving mental strengthening and stimulation which can be applied to chess. I find especially helpful ones which help calm the mind and allow you to perceive situations more objectively, which improves your analysis and judgment at the board. One should follow the dictates of the position, whether it tells you to attack or defend. It is a great deal easier to hear what it is telling you when your mind is not generating extra noise. For more on this, along with some of my own observations on cross-training and the Kung Fu of chess, it's worth highlighting that GM Nigel Davies has made some parallel observations on his Chess Improver blog. After long and sometimes hard experience, I've come to the conclusion that the most effective pre-tournament preparation consists of sharpening and focusing what you are (or should be) doing for your longer-term training efforts. This contrasts with the more common pre-tournament routine in which over the space of a week or two (at best) or a couple days (more often) players mostly spend time on openings and doing tactical drills, then put everything aside until the next tournament. This type of staccato and rushed approach resulted in little success for me as an adult player. During the scholastic phase of my career, I played in tournaments quite often, so without really trying I had constant exposure to new chess concepts and practical lessons, even though my (self-taught) training was not systematic. There's a lot to be said for simply playing a lot of longer time control games, which looking back on it now was probably my best chess improvement practice. Now with only sporadic participation in tournaments and a longer-term goal of improving my overall game, I've had to come up with something different for a training regimen, which has also meant a revised approach to pre-tournament prep work. The primary principle I use both for long-term training and in preparing for tournaments will be a familiar one to many: train the way you fight, then fight the way you train. This means that any training method used should accurately reflect, at least in part, the tournament game experience. Conversely, it also means that when in a tournament game, a player should rely on their training when making decisions, rather than impulsively "winging it" when faced with an unclear situation. One common example of this phenomenon is choosing to abandon your opening preparation when faced with a particular opponent. This typically occurs when there is a large ratings gap and a player feels that their openings aren't good enough (if the opponent is higher-rated) or that the opponent (if lower-rated) can be easily beaten in an unfamiliar line. Although I've codified things in a checklist format below and have indicated my own particular preferences, I want to clearly distinguish between the "what" and the "how" of tournament preparation. This means that it is more important for a player to train the various skill sets before a tournament, rather than how exactly they go about it. So within each category there will naturally be a number of options available regarding the materials and tools to be used for training. Methods can also vary greatly from player to player; the below is simply what has proven to work best for me. Tactical exercises. Perform at least one set of exercises for 10-15 minutes a day, or multiple sets if desired, with breaks in between them. Important: the exercises' objectives should be randomized. This means avoiding sets of "mate in 3" problems or the like. Your thought process will benefit most from having to figure out the best move from an original position, with no hints, as this is the reality of a tournament game situation. Limiting the time spent on individual sessions helps keep the mind active and engaged throughout the process (a state of "mindfulness"), aiding in the longer-term retention of tactical concepts and patterns. Finally, focus on relatively simple (up to three-move) combinations and motifs, as this is what you will see the overwhelming majority of the time during actual play. I primarily use the Chess Tactics Server, since it meets all of the above criteria. Training games. Play at least one slow (60 5 or 45 45 or higher time control) game per week against opposition of generally comparable strength. Tournament rules should apply (game clock, touch move, no takebacks allowed). Colors should be varied, either randomized each time or generally alternating over several games (no more than two Whites in a row, for example). Early resignation is not allowed, except for clearly losing circumstances (loss of a major piece, or a minor piece with no compensation whatsoever). I use Chessmaster: Grandmaster Edition for my computer opponents, playing in rated game mode and always playing the recommended next opponent after a game, a practice which adjusts their playing strength according to your performance. The Chessmaster opponents' Elo ratings are not always good reflections of their practical performance, but I've found that my own rating generated by the program is remarkably accurate. Opening preparation. Critically review all of your opening repertoire lines, concentrating on: a) the variations most likely to be played by your upcoming opposition; b) the most theoretically critical ones; and c) the most dangerous ones if you don't know/remember the theory. 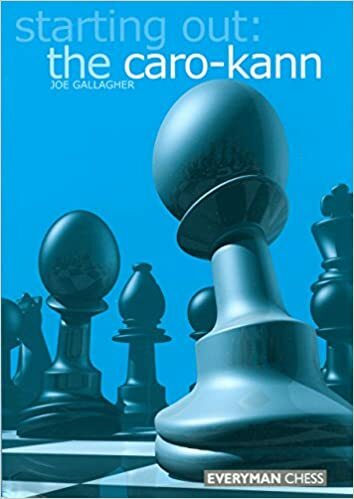 All of the above are reviewed using chess books and articles (including videos), as well as database searches, so that ideas can be studied and not just lists of moves. Taking the Caro-Kann variations as an example, I focus on the Main Line and the Advance Variation, with some attention paid to the Panov-Botvinnik Attack and the Exchange Variation (relatively common at the Class level), and finally the Fantasy Variation (as a potentially dangerous line). All the others get at least one run-through in my repertoire database so that I can be reminded of key ideas and concepts of play. "Big think" activities. While I'd consider the above three items to be fundamental, there's also an important role to be played by other activities that will energize your chess mind for the tournament experience. Going over master-level annotated games (preferably ones played by the author) is one example, as you are thereby directly exposed to winning concepts and effective thought processes via the game commentary. 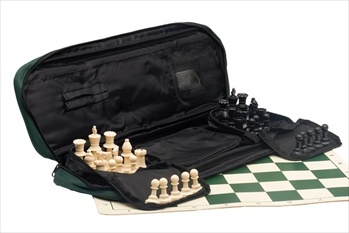 Other examples would include tackling middlegame and endgame books in a serious frame of mind, with the goal being to work through one particular book before the tournament. The lessons will then be fresh in your mind and you are more likely to see opportunities to immediately apply them in your games. Ideally an improving player is already doing all of the above types of things as part of a long-term training program. In that case, preparing for a tournament becomes more a question of choosing to increase the focus on certain priority items over a shorter time period. On a related note, I believe that a balanced approach to training chess skills will be the most productive for achieving good tournament results, rather than concentrating solely on one aspect such as tactical training or opening preparation, even if someone only has a short time period to put in the effort. This is because successful tournament play demands a broad range of skills and practical preparation, rather than just knowledge of chess theory or performing well in rote drills. As part of a balanced approach to pre-tournament preparation, it's also worth mentioning that players can choose to undertake certain mental preparations, which can be just as critical to one's tournament results as pure chess skill. This is the subject of a companion post on mental toughness. Finally, as with training in general, I believe people can and should have different approaches for tournament preparation, based on their learning styles and life circumstances. One of the things I appreciate about the chess improvement community is the opportunity that it offers to better understand and then compare/contrast others' best practices, so I can incorporate them (or modified versions of them) into my own program. So new ideas - at least ones that are new to me - and informed commentary about tournament preparation are always welcome. The next tournament game, following on the heels of my most instructive loss, is typical of my play during that period of my chess career. The opening is an English Four Knights with a slightly advantageous, or at least comfortable, position for White once the early middlegame is reached. I don't have a particularly good idea of where to place my pieces, for example the bishop on move 12, the rook on move 14 and the queen on move 19. These sorts of small positional errors accumulate and when White follows a skewed plan to push e4 using the f3 pawn as a support, tactics as a result appear for Black, who emerges up a pawn. By the end of the exchanging sequence on move 26, we have a double rook endgame where Black has a central passed pawn and another one easily created on the queenside. However, White is not lost, as his king is closer to the action and his rooks are active. These sorts of endgames are notoriously difficult for the side with a material advantage to win; the move required for Black to win on move 35 would have taken a great deal of accurate calculation and nerves to play at the board. White is able to exchange a pair of rooks and eliminate the central and queenside pawns in exchange for Black picking up two kingside pawns, which however means that Black's pawns will not be able to breach White's defenses. By move 41 the draw has taken shape, with White's rook in an ideal position to prevent Black's king from getting into the fight. By move 51 the draw is concrete, although it takes another 30 moves for my stubborn opponent to concede the fact (amusingly with both of us missing a threefold position repetition as well). Knowing an opening variation well is not enough, as some idea of the early middlegame requirements for the position is necessary to maintain momentum and accuracy of play. Many times it is sufficient simply to follow a plan of improving the position of each of your pieces in order to increase their activity. This is especially a good rule of thumb for when you know the opening well but lack experience with the resulting middlegame. This fourth-round tournament game is a strong contender for my most instructive loss. My opponent, perhaps around twelve years old, played the Panov-Botvinnik Attack against my Caro-Kann, which transposed into a Queen's Gambit Declined-type position; the computer in fact classifies it as a Queen's Gambit variant. The opening goes eleven moves before leaving the database, something of a rarity at the Class level. The middlegame features a tense duel between White's pressure and Black's countering moves. Black makes some inferior moves in the early middlegame (moves 15-16) but White then becomes overeager and plays a premature rook lift on move 17. The pendulum shortly afterward swings back in favor of Black, although after some back-and-forth the position simplifies into what should be a drawn rook and minor piece endgame. Shortly after this occurs, I play carelessly and White immediately takes advantage of this, creating multiple threats against my pawns that I cannot parry. Although I hold out until we reach a bishop endgame, White gains a decisive advantage and I resign. During the post-mortem analysis in the skittles room, my opponent's teacher/trainer sat in and provided some useful pointers. My opponent was originally rather cocky about his position in the opening, but his trainer then corrected his evaluation and pointed out how Black was doing just fine until the endgame error. Because of the key nature of this opening system and the typical tactical and strategic themes that were shown during this game, I feel like gained a great deal from playing and then analyzing it. Interesting how a loss can become a gain, in that respect.